Business travel, especially across multiple times zones, can be stressful and leave you feeling less than your best. But jet lag be damned: Making room for “personal artifacts” helps overcome the stress and puts you back on top when you’re working far away from home. I just returned from a rather long trip to Asia. Upon returning home, I unpacked my bags and got thinking about the importance of familiar items, or what I call my “personal artifacts,” during a long journey across a big time-zone difference. 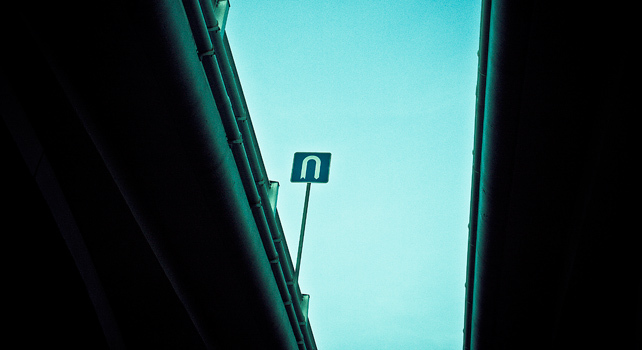 The fact is long-haul travel is disorienting, and being disoriented can put a person pretty far outside of his or her best mindset and attitude. Getting yourself into a “comfort zone” is important and difficult to do when you’re disoriented. It’s important to find a way to get back into the right frame of mind needed to process information and make good decisions, when being on the road can leave you compromised in that sense. I’m not only talking about this within the context of doing business or getting work done, whatever your work may be. It could be as simple as going for a walk in a new city on a Sunday afternoon and taking some photographs–even though you may not be in top shape to fully engage your eyes and ears, or you might be over-tired and have a brain full of noise. The best thing to do to get your brain back on track is to take good care of yourself. For business travel, this can be tough, but you really have to make time for it. Watch your eating and drinking, get some exercise and sleep well. Eat your vegetables…that whole thing. This is common sense, everyone knows this stuff, and I’m the worst person to be giving this type of advice, but I make the attempt to follow it. Back to my original point, unpacking my stuff led me to another realization. There are some personal artifacts that can help you remember who you are, in spite of unfamiliar surroundings. I find the best personal artifacts involve the senses. Your computer just doesn’t seem to activate the imagination or ground you the way an old favorite paperback novel or pair of quirky sunglasses might. 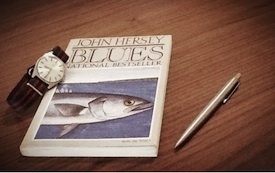 Personally, I bring along Blues by John Hersey, which I’ve read a million times, and reminds me of my New England roots, a vintage 1960s Omega watch my wife bought for me, and my Parker Jotter pen which always reminds me to cut the BS and get to the point. I realize this may sound contrived, but if you’ve ever fought your way to a taxicab with arms full of baggage in a strange country after 17 sleepless hours on a flight with a high-pressure week of work ahead, you know what I mean. Having a good shower and shave with your favorite aftershave from home (as opposed to some generic travel sized product from your hotel room) can make you feel not just like a person, but like yourself again. Or if you’re lucky enough to a nice iPod-docking stereo in your hotel room, it can be restorative to listen to Band of Gypsys or Relationship of Command for the 8,000th time like I do (though your mileage may vary). Reconnecting with yourself is an important process when you’re in unfamiliar territory. A bit of familiarity can go a long way in helping you stay sharp, be focused, and make good decisions when you hit that conference room in a foreign city after a mediocre night’s sleep. The least you can do to help yourself cope is to bring the favorite pen your dad gave you and maybe even that old military-grade watch that makes you feel like Lee Marvin. You’re only a passenger when you’re in transit. When you’ve arrived, be yourself again.